Extinction is the termination of evolutionary lineage . The most common extinction event is the loss of a species. There are many reasons why a species might die out. Human intervention (either directly or indirectly) has become the leading cause of species extinction (possibly for the last fifteen thousand years). An important distinction must be made between true extinction and extirpation. Extirpation is the loss of a population, or loss of a species from a particular geographic region. A famous twentieth-century example is the extirpation of wolves from the Yellowstone region of Wyoming. The park service reintroduced wolves to Yellowstone in the 1990s, and these predators appear to be adapting well to their new home. True extinction must also be differentiated from pseudoextinction. Biologists studying the changes that take place in a lineage over time often designate distinct morphological stages as separate species. The extinction of a species in this context is not the result of the termination of a lineage, but rather the transformation into a new form. A clear understanding of the definition of a species is necessary in order to discuss extinction. This is not a simple question, but one view defines a species as a population of potentially interbreeding individuals that is reproductively isolated from other such populations. By this definition the relatively common mating between coyotes and domestic dogs raises the question of the validity of their separate species status. Species go extinct primarily because they are unable to adapt to a changing environment. Animals with specialized food or habitat requirements, such as the giant panda (which feeds almost exclusively on bamboo), are particularly susceptible to environmental changes. Generalist species that feed on many types of food and live in a variety of settings are much more able to survive in a changing environment. For example, raccoons are common city dwellers, where they forage from trash cans instead of from streams. In addition, species with long generation times that produce few offspring are often vulnerable to extinction. If a population of animals is very small, it is subject to extinction from a variety of factors, such as disturbances and diseases. A dinosaur skeleton on display at the Royal Terrell Museum in Dinosaur Provincial Park in Alberta, Canada. Organisms with short generation times that produce a lot of offspring, for example, many rodents and insect species, are often capable of increasing their populations quickly and therefore become less vulnerable to extinction. However, animals such as the rhinoceros or Siberian tiger take several years to mature and when they do reproduce only give birth to one or two offspring. Thus, species such as these cannot rebound from low populations quickly and thus are more likely to go extinct. A firm grasp of ecological principles is crucial to an understanding of how species interactions can lead to extinction. Two species with significantly overlapping niches are unlikely to coexist over time unless some mechanism prevents either species from reaching its carrying capacity (the maximum number of individuals the habitat can sustain). Typically the species that is better adapted will drive the other species to extinction. This phenomenon is particularly important because of the widespread introduction of exotic species by humans. Many studies have shown the impact of domestic cats and dogs on native prey species. Less obvious, however, is their competitive impact on native predators. The extinction of the Tasmanian wolf in the twentieth century is probably the best-known example of this negative impact on biodiversity. Typically whenever there is considerable overlap between the niches of a placental and a marsupial the placental will win out. The reasons for placental superiority are not entirely clear (relatively greater intelligence and reproductive physiology are possibilities), but this fact probably accounts for the existence of only one successful species of marsupial in North America, the opossum, a broad generalist with a very high reproductive rate. Mass extinction events have occurred periodically in Earth's history. Three of these events are particularly relevant to mammalian history. The first was the Cretaceous-Tertiary extinction 65 million years ago that led to the demise of the dinosaurs. Mammals and dinosaurs coexisted for approximately 140 million years, during which time dinosaurs dominated the majority of large terrestrial vertebrate niches. This extinction most likely was the result of a large meteor impact that eliminated over half of all species on the planet. Mammals survived that extinction event relatively well, probably because the majority of Mesozoic mammals were species with short generation times and large litters. During the Tertiary period, mammals underwent a rapid adaptive radiation , filling niches similar to those vacated by dinosaurs. A second major extinction event occurred during the Eocene-Oligocene period, 30 to 35 million years ago. This extinction was the result of global cooling due to changes in ocean current patterns. Prior to this period modern families of mammals comprised only about 15 percent of the mammalian fauna; after cooling modern mammals made up more than 50 percent of the fauna at the family level. 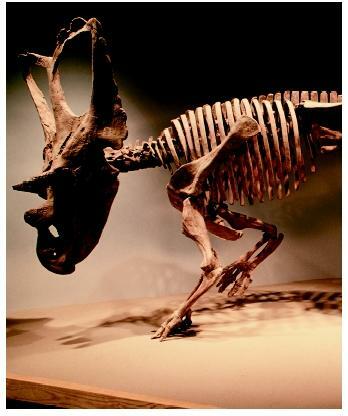 The third mass extinction event began around 15,000 years ago and is still ongoing. Large species (mammoths, ground sloths, horses, camels, and lions) were more adversely impacted by the most recent extinction event than other taxa. In the twenty-first century, there are only about a dozen species of large mammals (over 100 pounds) in North America. As recently as 11,000 years ago there may have been three times that number. There is controversy about what caused the extinction of these large mammals. Three possibilities include global warming at the end of the last major glaciation, overkill by early North American humans, and contagious diseases. The timing of each of these events correlates with the time of extinction, therefore determining which hypothesis is most likely must be based on the merits of each argument. Reduction in size of suitable habitat is the most likely factor if the extinction is due to climatic change. Much of North America was covered by a grassland habitat during the last glacial period. As this habitat declined the largest species may have been unable to adapt to the new conditions. Migration of humans into North America is the causative agent for the other two hypotheses. According to these models, the megafauna went extinct either directly through predation by a highly efficient hunter or indirectly by the introduction of exotic, infectious organisms. Carolina parakeets collected in 1870 and housed in the British Museum of Natural History in Tring, England. 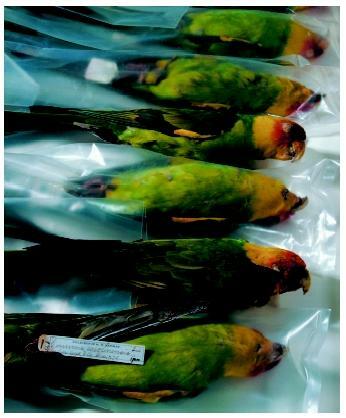 Many of these birds were shot becaue they were eating fruit crops. Within a few decades, the species was extinct. In the late twentieth and early twenty-first centuries, large-scale habitat destruction in tropical forests and elsewhere has caused extinction of significant numbers of species, many not fully identified. Pressures from population increase, agricultural expansion, and forest cleaning threaten many thousands of species throughout the world. Courtillot, V. Evolutionary Catastrophes: The Science of Mass Extinction. New York: Cambridge University Press, 1999. Lewin, R. The Sixth Extinction: Patterns of Life and the Future of Humankind. New York: Anchor Books, 1996. Pianka, Eric. R. Evolutionary Ecology. San Francisco, CA: Benjamin Cummings, 2000. Raup, David. Extinction: Bad Genes or Bad Luck. New York: W. W. Norton & Company, 1992. Vaughan, Terry A., James M. Ryan, and Nicholas J. Czaplewski. Mammalogy. Fort Worth, TX: Saunders College Publishing, 2000. The giant panda actually has a carnivorous digestive system, so it must eat voraciously for 10 to 12 hours to consume enough bamboo (up to 66 pounds [30 kilograms]) each day.